In conjunction with the existing treatment plant, the premium manufacturer will in the future recycle about half of the wastewater produced at the Ingolstadt site. Audi Ingolstadt is the largest production site of the Audi Group and the second largest car factory in Europe. More than half-a-million cars leave the Audi plant at the Ingolstadt site each year. German car maker Audi has reported reaching another milestone on its way to wastewater-free automobile production. The company has put a new service-water supply centre into operation at the Ingolstadt plant. In conjunction with the existing treatment plant, about half of the wastewater produced at the site can now be recycled and treated for reuse. In this way, Audi will saves up to 500,000 cubic metres of fresh water each year. The heart of the service-water supply centre is the so-called membrane bioreactor (MBR). Water is necessary in the entire manufacturing process of an automobile, for example in the paint shop. With the new service-water supply center, Audi is going new ways at the Ingolstadt site and making even more efficient use of water as a resource. Before the company returns the wastewater as fresh service water to the production processes at the Ingolstadt plant, it is treated in up to three stages. It first passes through a chemical-physical process. This neutralises alkaline and acidic components and removes heavy metals, for example from the paint shop. The membrane bioreactor is then used. It is the core element of water treatment. Here the production water is mixed with sanitary wastewater and freed from organic components. The MBR then removes bacteria and viruses from the wastewater using pore-fine membranes. Audi is thus taking water treatment one step further than conventional sewage treatment plants that do not use this process. Finally, reverse osmosis removes residual salts. The treated wastewater is then returned to the production process as service water. With the new service water supply centre, Audi will save up to 500,000 cubic metres of fresh water each year. 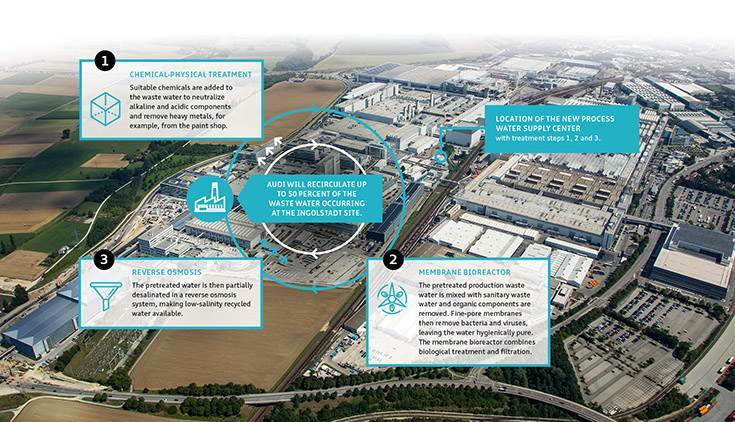 In conjunction with the existing treatment plant, the premium manufacturer will in the future recycle about half of the wastewater produced at the Ingolstadt site.